Now that I have my Christmas decorations out I want the house to be clean all the time so that everything looks beautiful. With toys and papers everywhere, I can hardly see the Christmas stuff! Only trouble is, I keep having ideas! Saturday afternoon when I could have been cleaning I got the children together and made this gingerbread house instead. This year I wanted to try a dormer window. My daughter did the cardboard engineering to make the pattern, and just look at how it turned out! 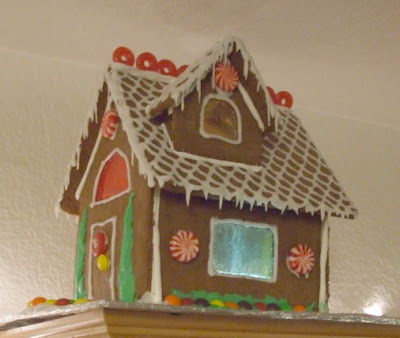 We cut a hole in the base before we built the house so that I could put lights up inside and take full advantage of the sugar candy windows. I might have had some time to clean today, but then I remembered those delicious chocolate cookie peppermint ice cream sandwiches that I like to make this time of year. After that I hit on an idea to make a star for the top of our Christmas tree using a cereal box, tin foil, and a string of lights. The children got in on the project too - my nine-year-old drew the circles with the compass and stuck them onto the foil, while my daughter scored the fold lines for the triangles and helped with the hot glue gun. I'd been talking about popcorn chains, so the children insisted that we spend the evening making them. They look just charming on the tree, but it took nearly two hours to string them and then there was popcorn all over the floor. I'll get it all cleaned up by Christmas. I love it. Read my post about the mom "boasting" of her children's presence, instead of trying to hide it. It cracked me up. It perfectly sums up what you've been doing with your children. You've certainly got your priorities in order. Wow! I am totally impressed by your skills! how fun! everything looks great. the gingerbread house is so beautiful. 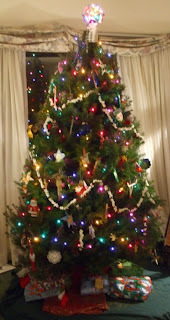 my little min wants to make one this year...we'll see. Hey, Bec, if you want to borrow our pattern you can have it. We are having our Gingerbread house decorating party today! We love your idea of using the crushed candy for stained glass windows. How pretty... very nice job on the Gingerbread House. I think I have the same problem... I worry too much about the house being clean that sometimes I undermine the 'family' and 'children' aspect of the home.